Opportunities for photography have been sparse the last few weeks with the cold, ice, rain, and cloudy days. Even our almost 13-year old Irish Setter who is blind was frustrated. One of his main joys in life is sleeping in the sun coming through the windows. He can see light and shadows and follows the sun from room to room. A couple of weeks ago after multiple days of no sunshine, my wife and I heard this sharp bark. Typically, it means I am lost or I need to go out now. We both hurried to find him. He was standing at the window still barking as to tell the sky he wanted some sunshine! I felt like joining him. Finally, the sun appeared an it was time to set out in search of adventure! On Monday, friend Steven and I headed south to the furthest southern reach of the Hoosier National Forest. Our destination was the German Ridge Recreation Area near Derby and within sight of the Ohio River. Our first stop was at an overlook where we viewed several interesting outcrops. I need to return to the area in the future to photograph these structures. We returned to the main road for a mile or so when we turned on a gravel road. The road was solid and took us through some remotest and wildest areas of the forest. The trees were magnificent as was the whole forest. It seems like we were always going up a steep hill with no place to stop and take a photograph on the one-lane road. At the top of ridge, Steven found a road he wanted to explore, except it was closed with a no trespassing sign. His map showed that we could reach the area of interest by going down the hill and following another road. We had to drive up a fairly steep hill in my all-wheel drive SUV on a good quality gravel road to reach our destination. I kept up a good speed so that we could make it up the hill. By the time we came to the top, we crested the hill with a good bit of momentum and started down the other side. Before I could react, we both saw the nice gravel road deteriorate into a muddy mess with deep ruts. It was a slippery slide down the hill to a relative flat area that had gravel. I worked to turn around and then we stopped to stare at the muddy incline. I had just purchased new tires that the salesman said were good for all terrain, gravel, rain, snow, volcanic eruptions, and outrunning bears. But, nothing was said of mud. I told Steven I was not sure we could make it, but he was confident. We plotted a path and I accelerated to build some speed before we hit the mud. There was a lot of mud flying and gnashing of teeth as we made our way to the top. Somehow, we made it with no spinouts on one try. The key lesson is, never assume that road on the other side of the hill is the same quality as the current side. We drove on to our second location near Derby, but had to detour due to a closed road. We followed the Ohio River to Tell City where we had lunch once again at the Pour Haus. No photographs today, but an interesting adventure. On Tuesday, my coauthor, Carroll, drove us to an area near Connersville to search of trees for a book we are developing. We had a long list of places to visit depending on our time. Our first stop was Shrader-Weaver Woods Nature Preserve. I had visited the area a couple of years ago with Steven to photograph wild flowers and remembered some really great trees. I have another knee replacement surgery scheduled in 3 months, so I wanted to go light on the hiking. I took one camera, one lens, and a tripod to lighten my normal load. The hike through the forest was stunning with the only the sound of birds singing and woodpeckers. There are two trails one can take. The woodland trail is relatively flat and crosses a few small streams with bridges. The succession trail travels off the upper part of the preserve and along a wetland area that can be soggy at times. We opted for the woodland trail since I had hike both on a prior visit and felt the lower trail might be too wet for travel. We found several trees we estimated were 150 to 200 years old. Each tree had lots of character. Fortunately, Carroll is great at identifying a tree in the winter and taught me the process of looking at the bark, downed leaves, and signs of nuts. To stand beneath and walk among the trees is a spiritual experience. 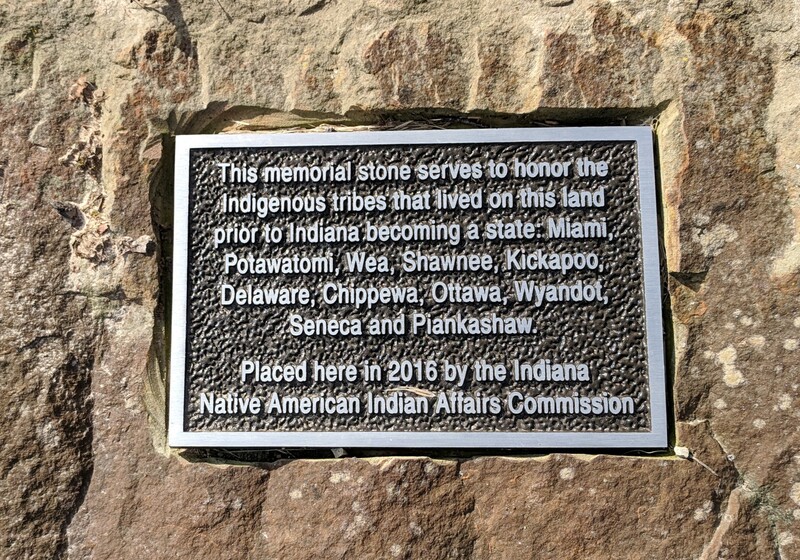 The walk was even more exciting knowing that we might be walking in the path of early Native Americans who lived in this area. We found magnificent examples of black walnut, butternut, tulip poplar, and the largest cherry tree I have ever seen. George Washington would still be chopping on it! As we were finishing our hike with the thought of lunch in the back of our mind, a fellow hiker stopped to talk. When he heard we were searching for magnificent trees to photograph he asked he if we had photographed the 800-year old bur oak. It was on the succession trail and I mentioned I thought it would be too muddy and wet. He said it had been re-routed. We started our search for the old bur oak that he said was easy to find. After we descended the hill down to the bottom land, we found a nice board walk to keep us out of the mud. Once the board walk ended, we were on soft ground. It seems the new trail followed a well-worn deer path given the foot prints. After some hiking, we came to one of the youngest of the bur oaks, maybe two or three hundred years old. 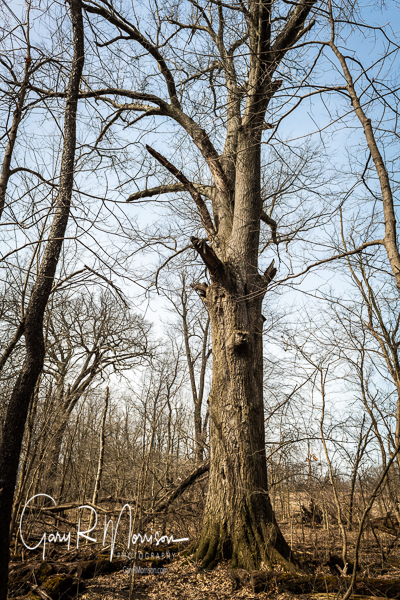 After more hiking, we found another old bur oak, but it was not in the location described by the fellow hiker. We debated if we had been given the wrong information and if we should return to the car. 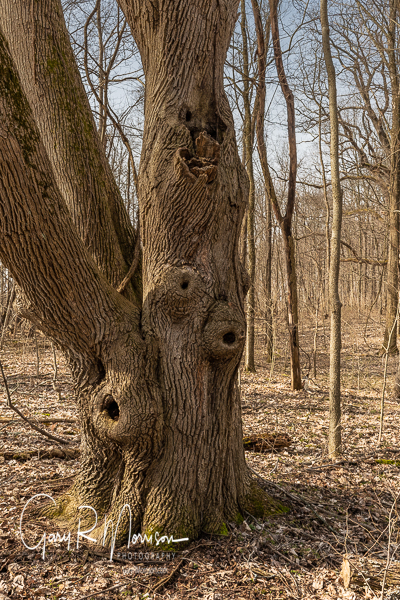 The other hiker did describe three bur oaks and we found two. We decided to move forward although we were both feeling tired. When we were about to give up on our search, we found the 800-year old bur oak! It was truly magnificent. Seeing such a tree makes one pause and pay tribute. This tree was almost 200 years old when Columbus landed in America and probably 500 years old when the first white settlers ventured into the area. After taking in the history, we photographed the tree and then headed back to our car. When we arrived at our car, we were both tired and hungry. We suddenly realized it was 3 o’clock and we had missed lunch! When you are hiking through these old growth forests, one loses a sense of time. What is three hours in comparison to 800 years? After eating lunch, our final search was for a very large magnolia cucumber tree. After entering the wrong address for Lick Creek Cemetery, we found the correct location and the tree. Unfortunately, it was no longer the specimen we had seen posted on the Internet. One large part of the trunk had broken off and was missing. Disappointed and sad, we headed home. We did not get the planned photograph of the magnolia cucumber tree, but we did find several other great examples!